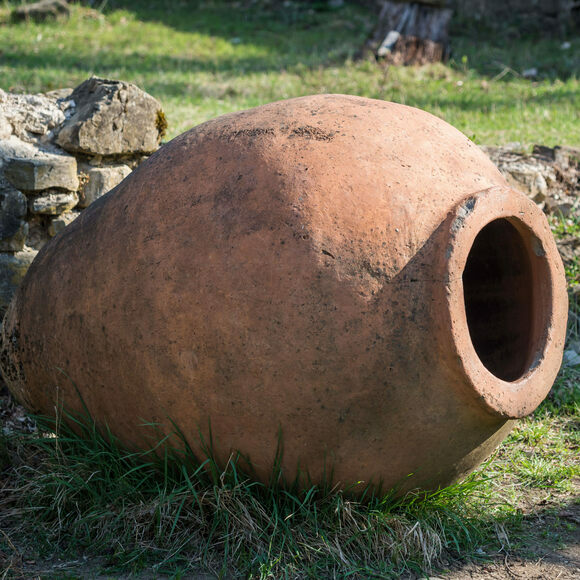 Georgians have been making wine for 8,000 years. Today, vintners in the Eastern European country still make their singular wine with methods that have been passed down over hundreds of generations. The tool central to this preparation is the qvevri. Qvevris are gigantic terra-cotta vessels, handmade by only a small number of remaining craftspeople, who likely learned the trade from their parents. These artisans can take weeks, or even months, to make a single qvevri. Working with simple wooden tools, they have to feel out the exact proportions of each lemon-shaped vessel, because any slight imbalance in weight or thickness could totally destroy it. Once a qvevri is finished, however, it can be used for decades, if not centuries. In this way, it’s a product worth the wait and effort. Completed qvevris are buried in the ground, usually in cellars that become important sites for the household and wider community. Though many vintners ferment red grapes with their skins, Georgians also do so with white varieties. The qvevri’s distinct shape allows the grape seeds and skins to sink to the bottom while the fermented juice stays on top to mature, picking up subtle notes of apples, raisins, and nuts from the solids below. The resulting white wines are wholly unique in their amber color, complex flavor, and rich tannin content. Between vintages, qvevris are rigorously cleaned with lime, water, and a special brush made from cherry bark. Scrubbing one of these monstrous vessels once it’s set in the ground is not exactly an easy job. It’s hard enough if you’re cleaning a 20-liter qvevri, harder still if you have to clean one that’s big enough to step inside. Some qvevris are big enough to hold several thousands of liters of wine. The art of qvevri-making has been preserved and spread throughout the world thanks to UNESCO's recognizing it as an item of “intangible cultural heritage of humanity" in 2013. Wine is absolutely integral to Georgian society, so be sure to partake when you visit. This monastery has been making wine with qvevris for thousands of years. You can tour the wine cellars and buy their authentic Georgian wine.